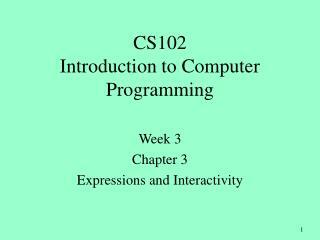 Week 3 Chapter 3 Expressions and Interactivity. 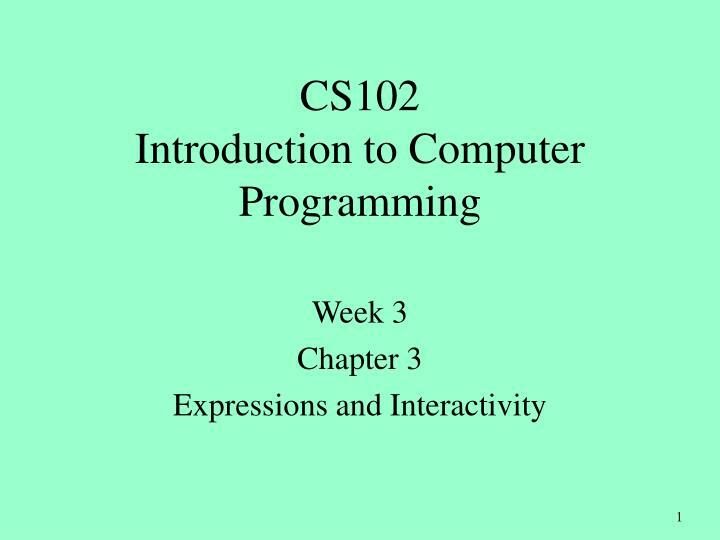 CS102 Introduction to Computer Programming. 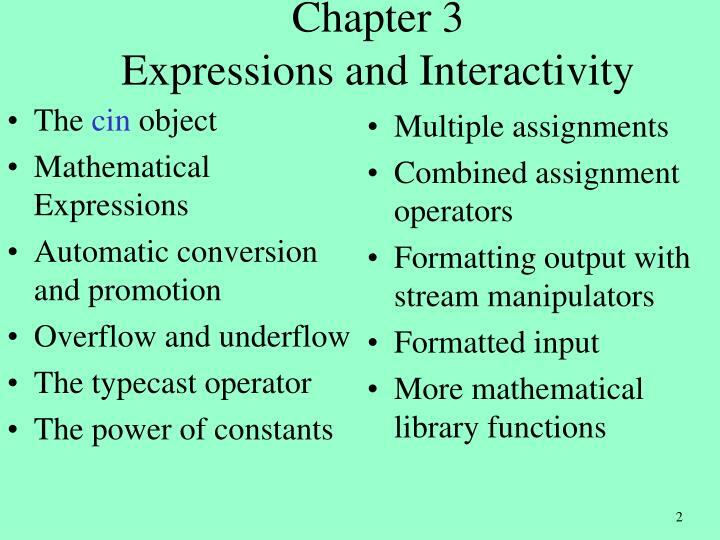 Chapter 3 Expressions and Interactivity. 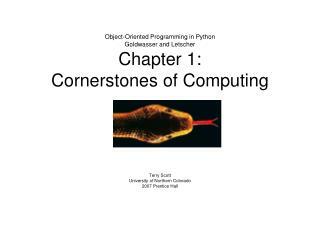 The cin object Mathematical Expressions Automatic conversion and promotion Overflow and underflow The typecast operator The power of constants. 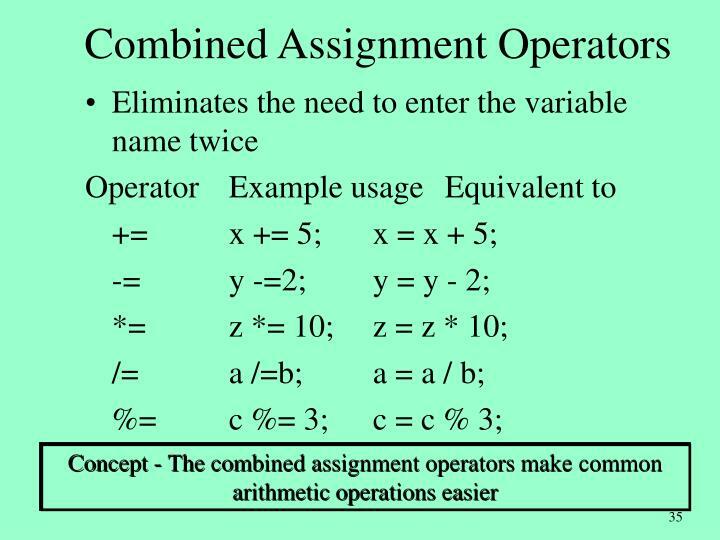 Notice the >> and << operators appear to point in the direction information is flowing. 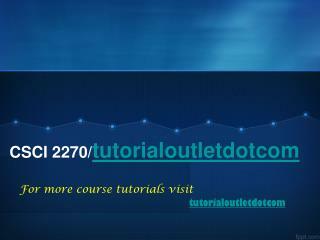 cout <<"The area of the rectangle is "
The area of the rectangle is 200. 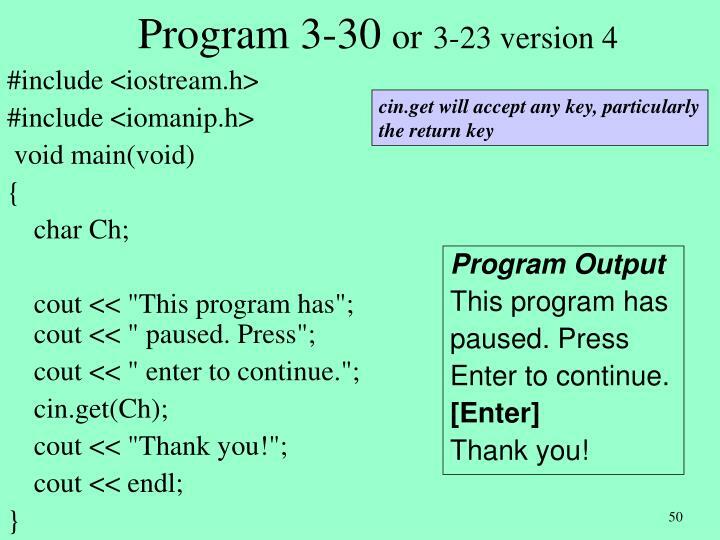 This program does not let the user know what is needed as input. 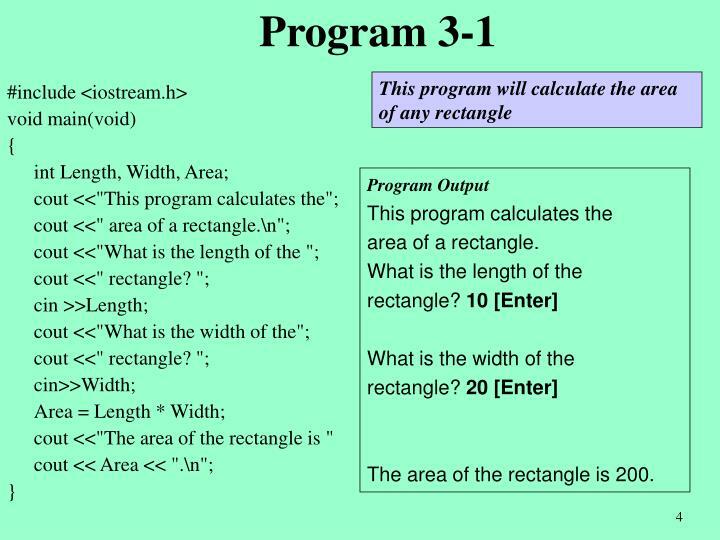 The Variables are assigned values in the order they are entered. 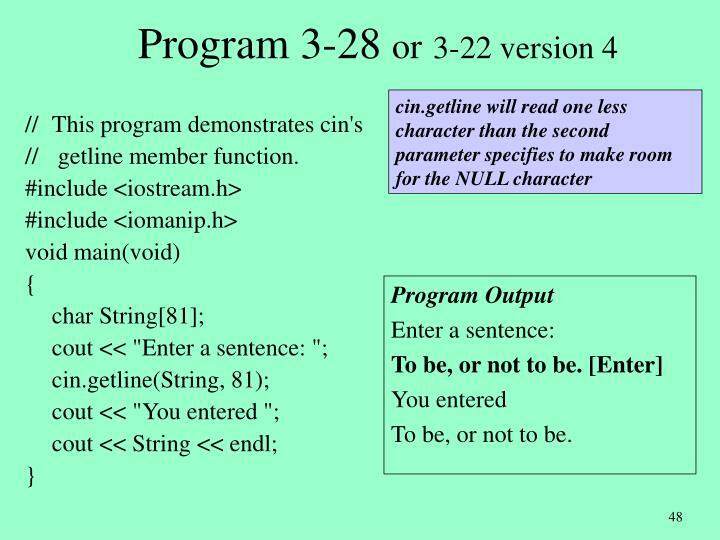 cin can read strings as well as numbers. 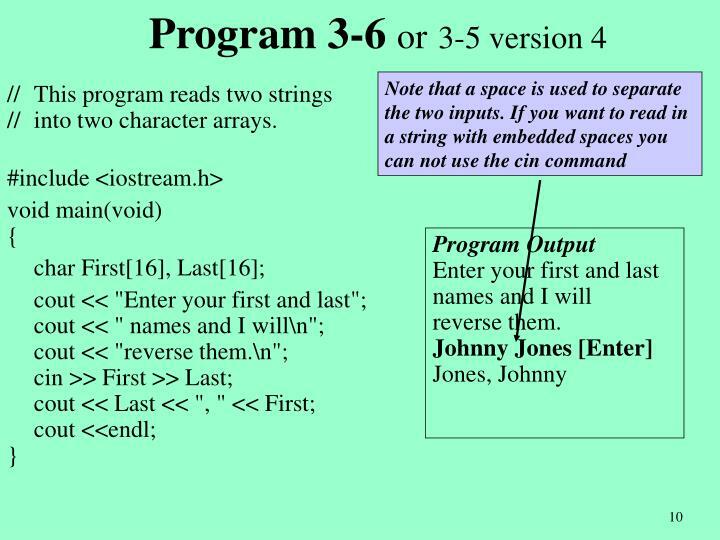 Strings are stored in character arrays. 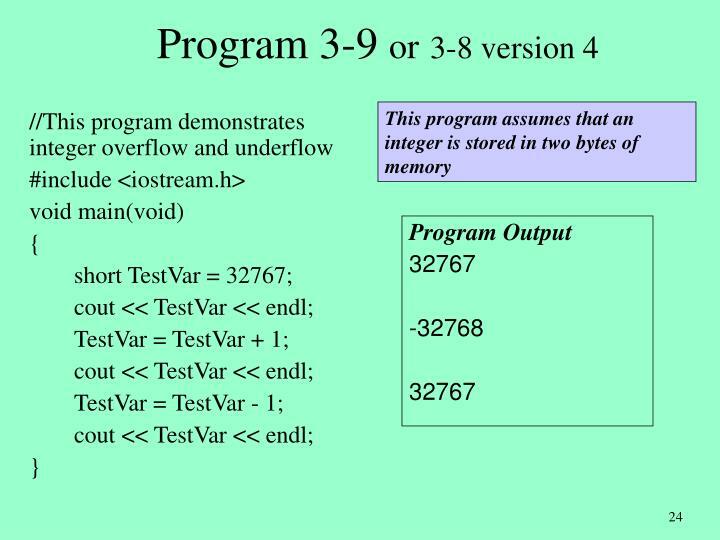 //	into two character arrays. 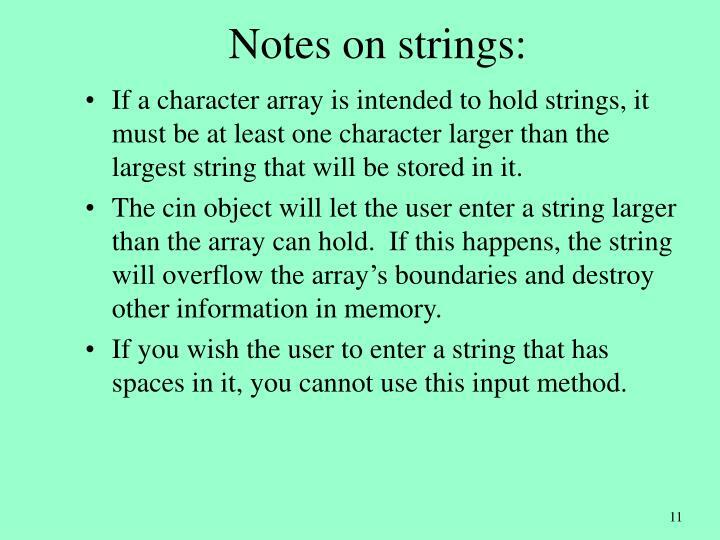 If a character array is intended to hold strings, it must be at least one character larger than the largest string that will be stored in it. 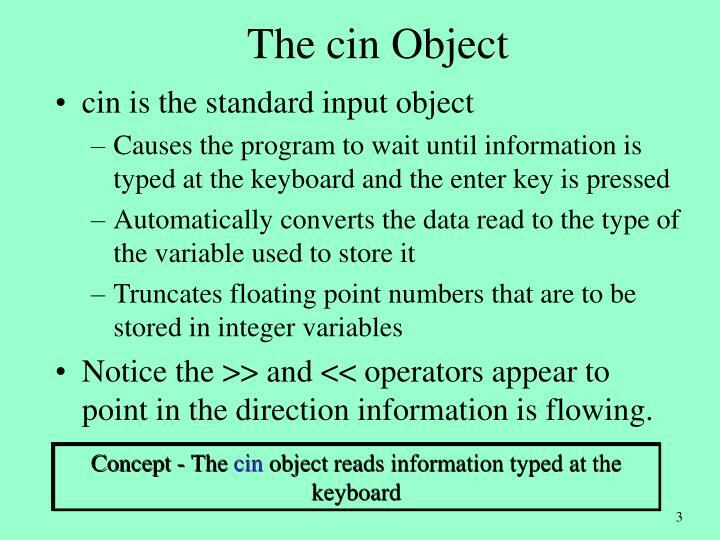 The cin object will let the user enter a string larger than the array can hold. 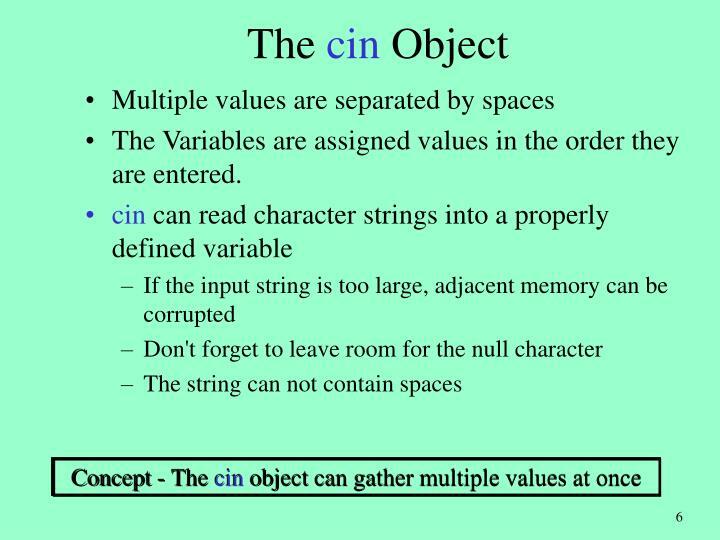 If this happens, the string will overflow the array’s boundaries and destroy other information in memory. 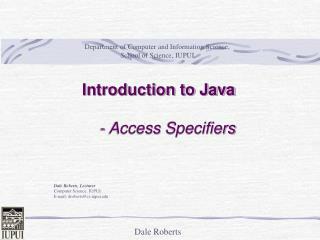 If you wish the user to enter a string that has spaces in it, you cannot use this input method. 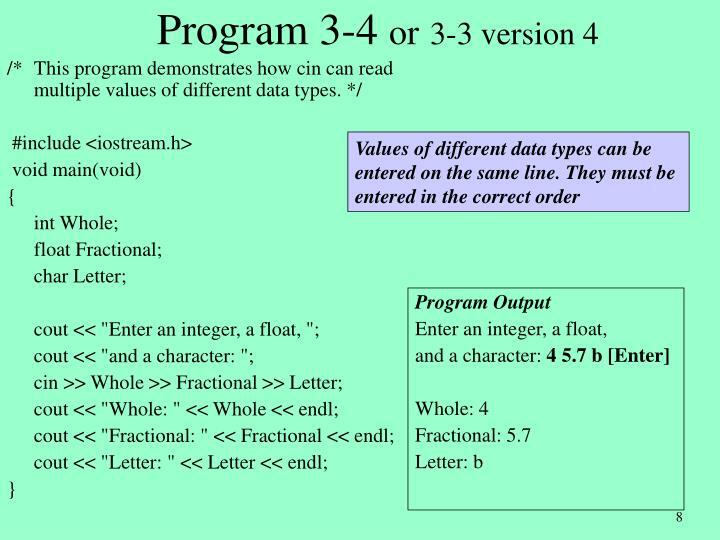 3.1 What header file must be included in programs using cin? 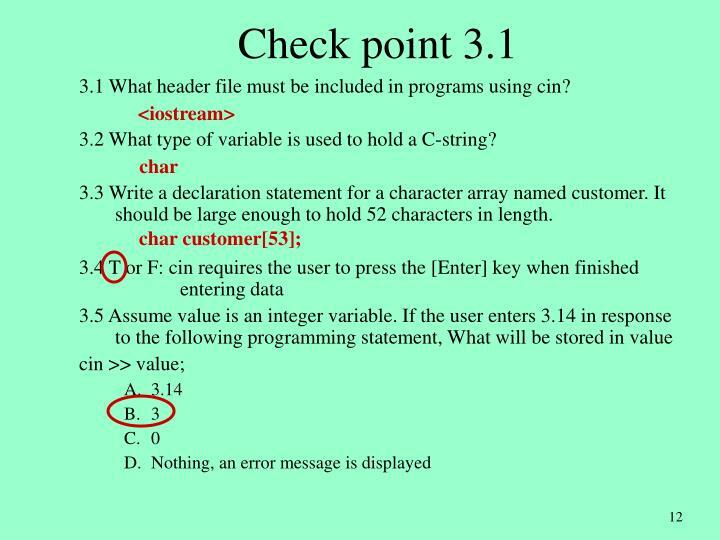 3.2 What type of variable is used to hold a C-string? 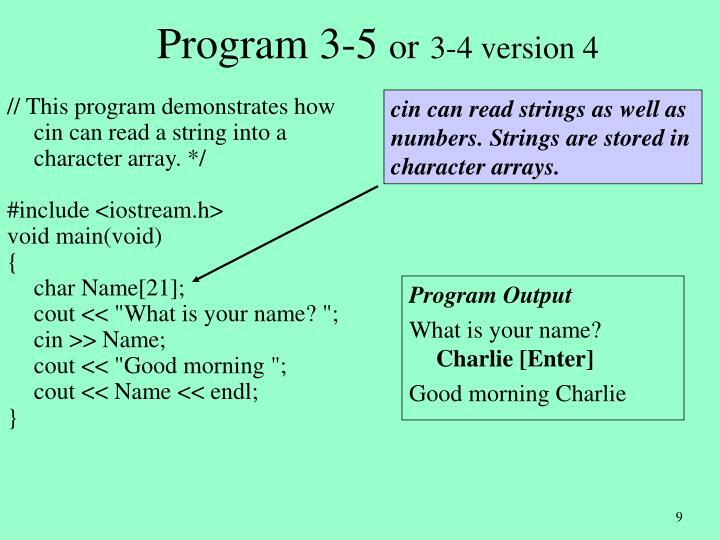 3.3 Write a declaration statement for a character array named customer. 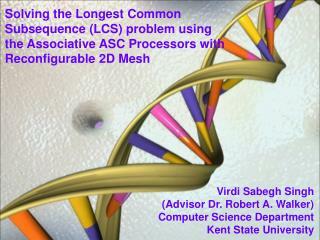 It should be large enough to hold 52 characters in length. 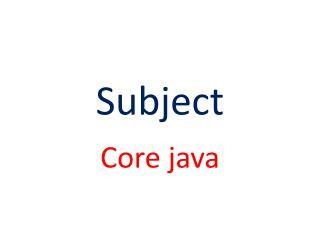 Can be used by the cout object to display the value of the expression. 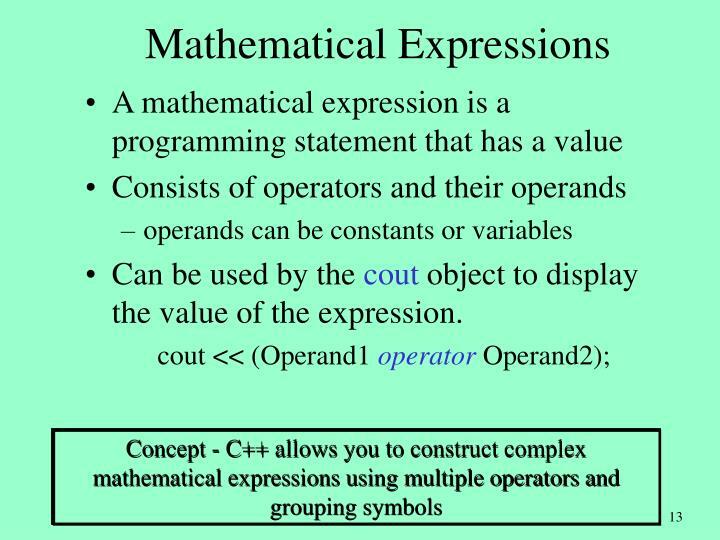 Mathematical expressions can be used in cout statements. 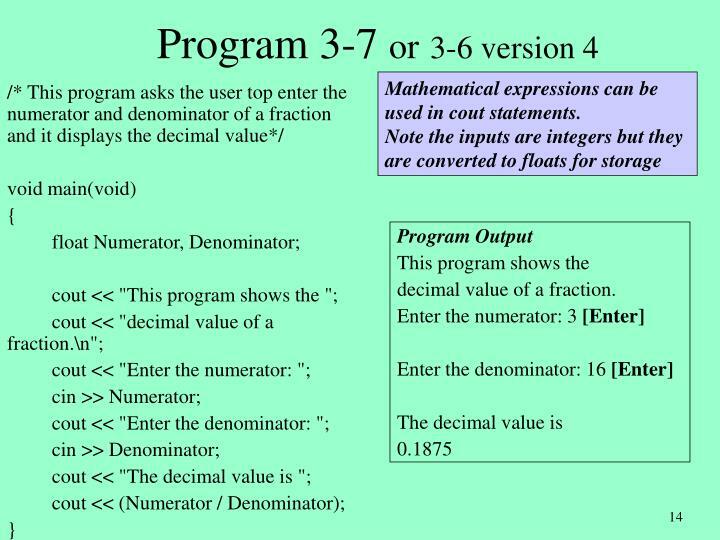 decimal value of a fraction. 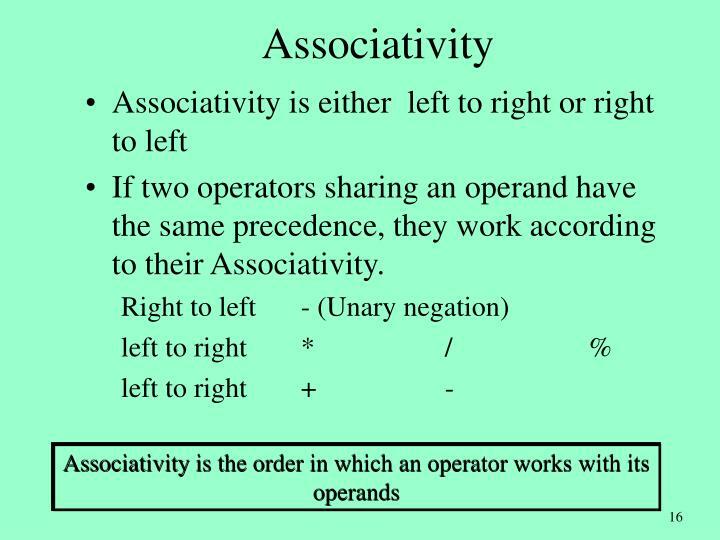 If two operators sharing an operand have the same precedence, they work according to their Associativity. 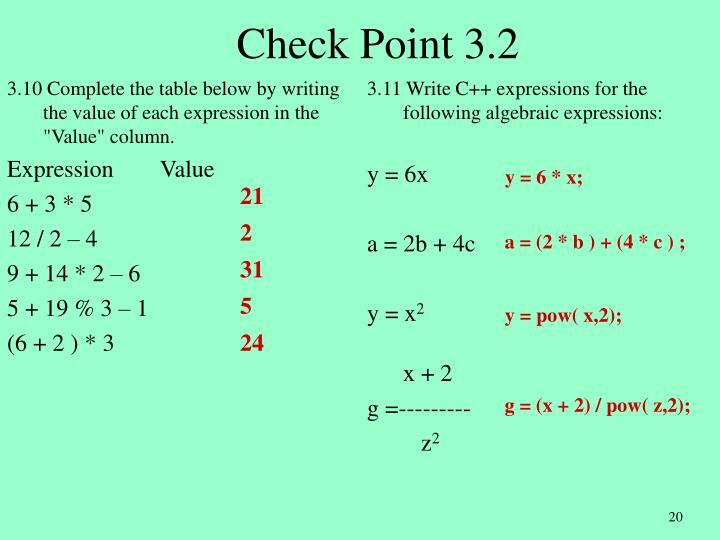 3.10 Complete the table below by writing the value of each expression in the "Value" column. 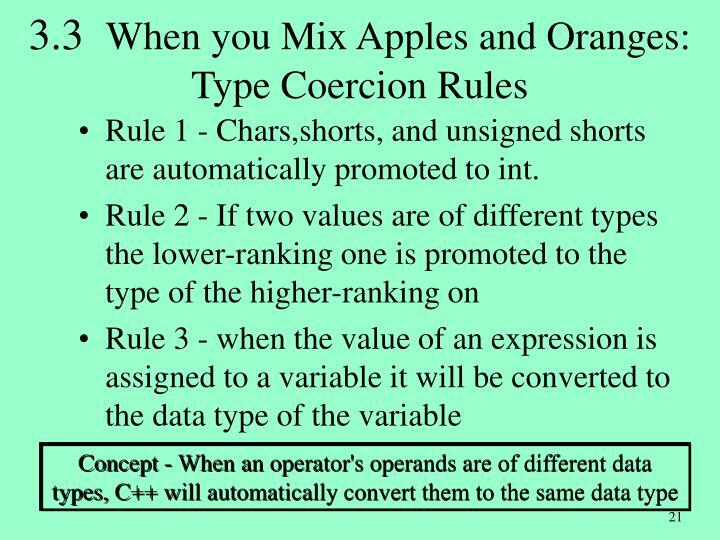 Rule 1 - Chars,shorts, and unsigned shorts are automatically promoted to int. 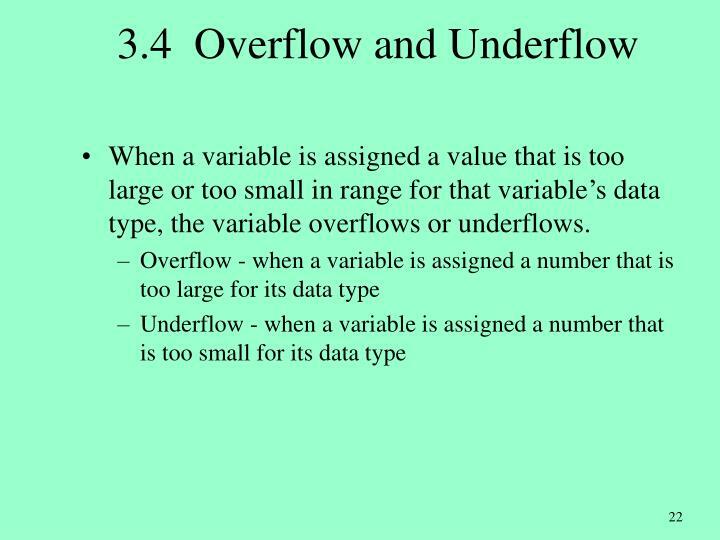 When a variable is assigned a value that is too large or too small in range for that variable’s data type, the variable overflows or underflows. 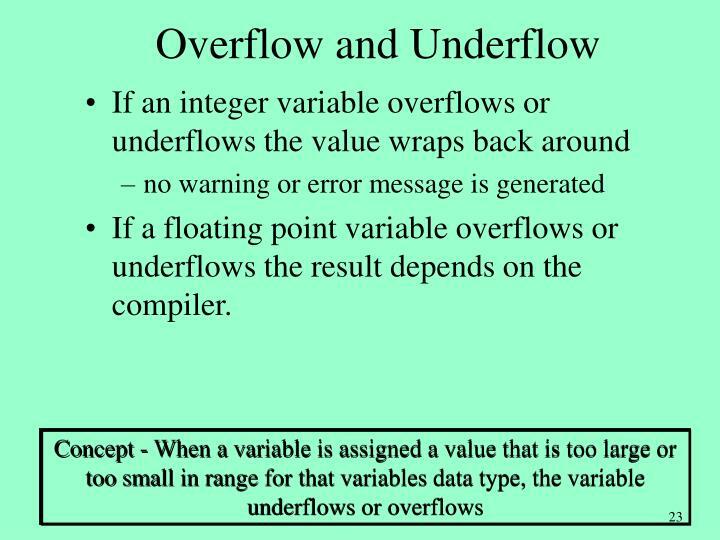 If a floating point variable overflows or underflows the result depends on the compiler. 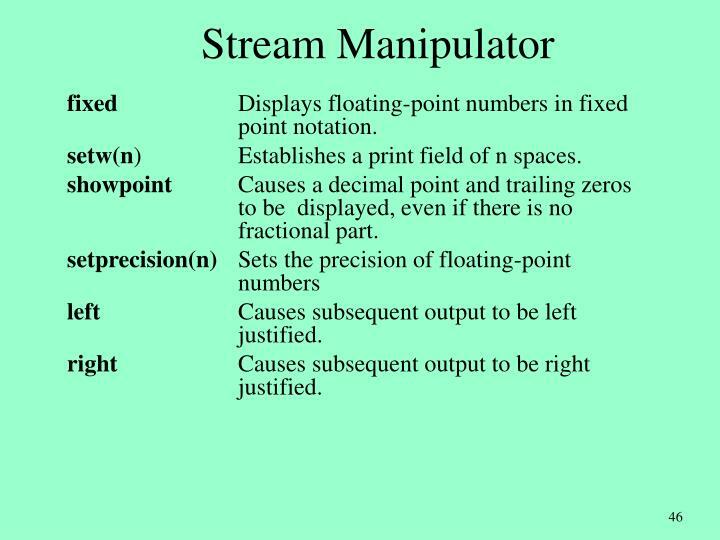 // point overflow and underflow. 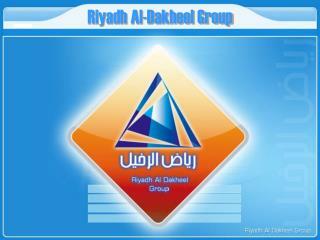 it take you to read them? 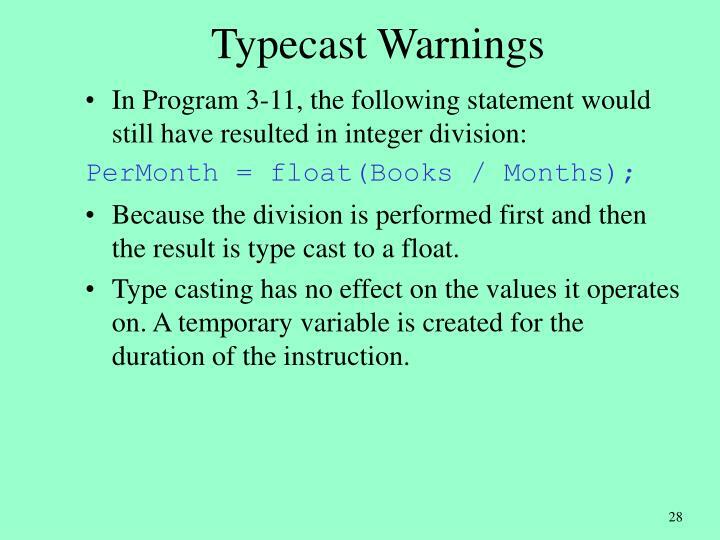 Because the division is performed first and then the result is type cast to a float. 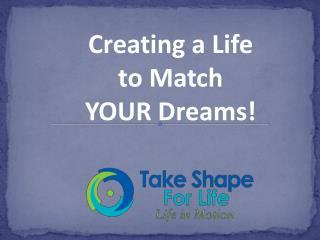 Type casting has no effect on the values it operates on. 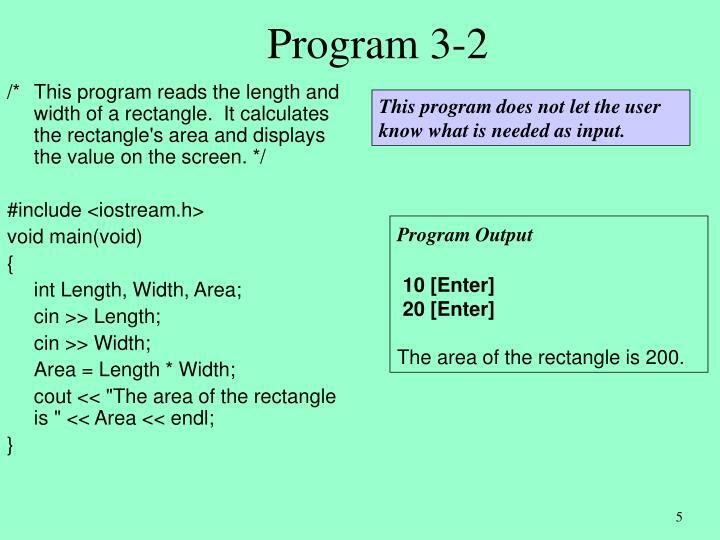 A temporary variable is created for the duration of the instruction. 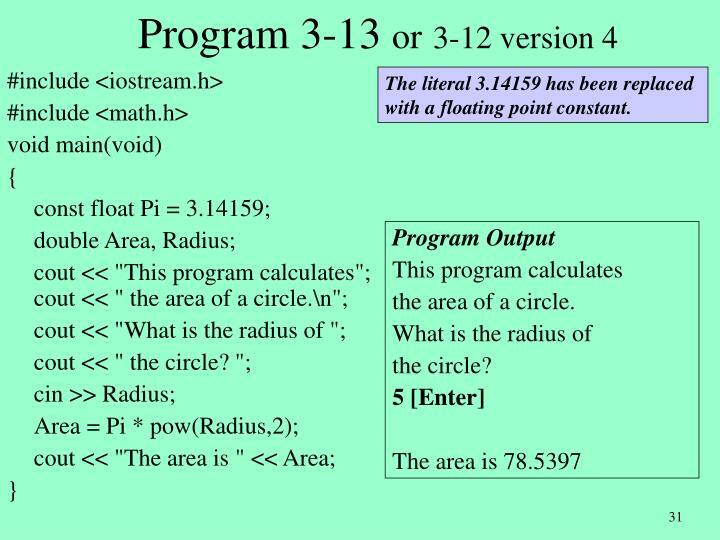 The literal 3.14159 has been replaced with a floating point constant. 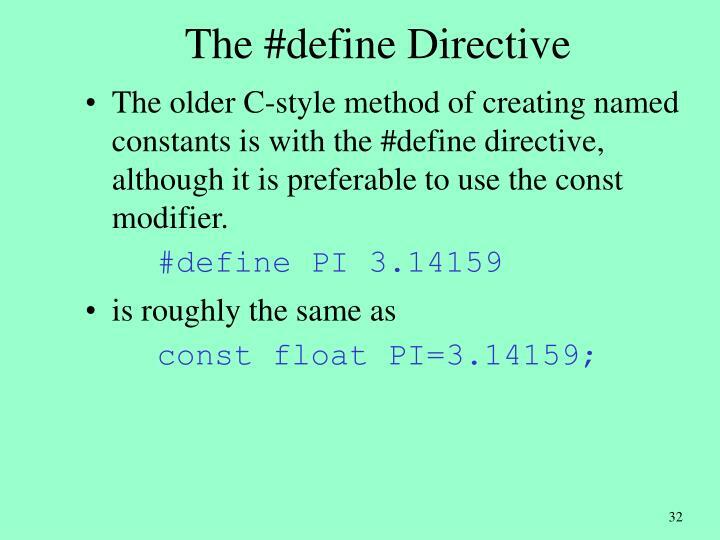 The older C-style method of creating named constants is with the #define directive, although it is preferable to use the const modifier. 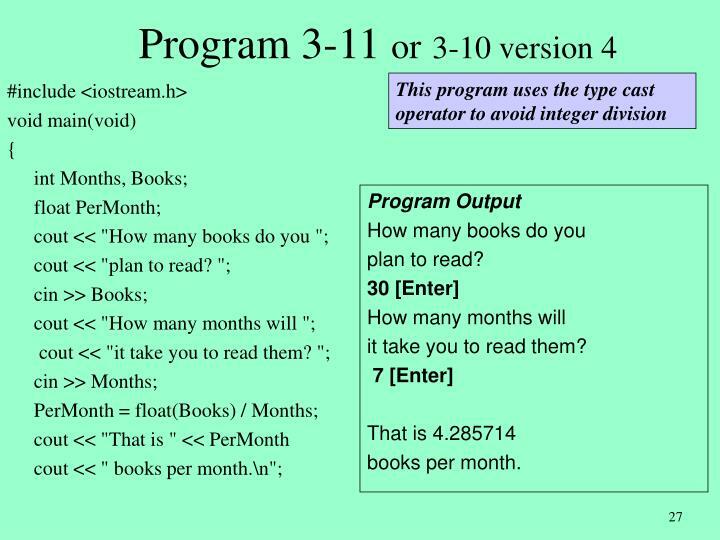 Remember that the preprocessor performs a textual substitution. 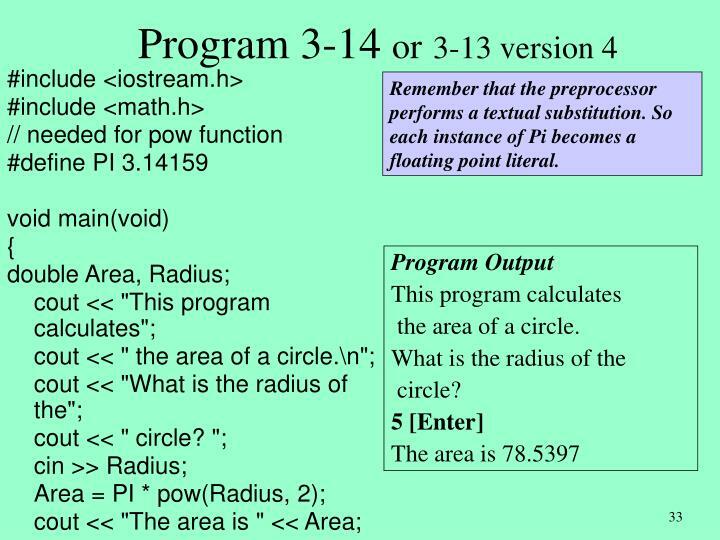 So each instance of Pi becomes a floating point literal. 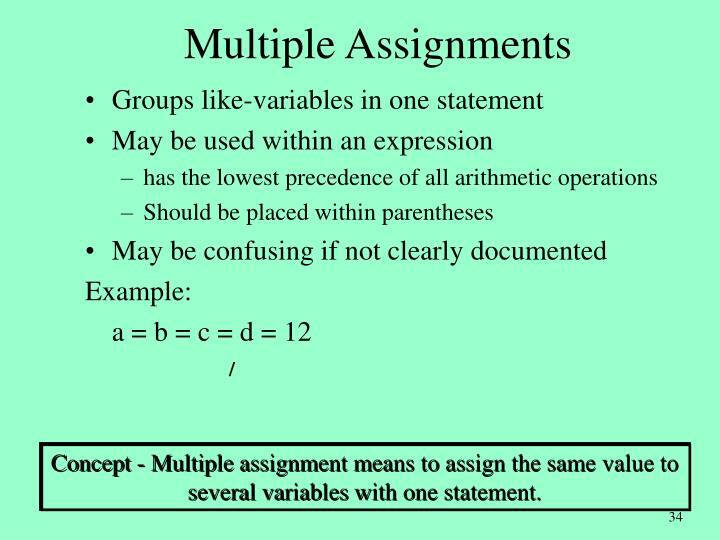 Concept - Multiple assignment means to assign the same value to several variables with one statement. 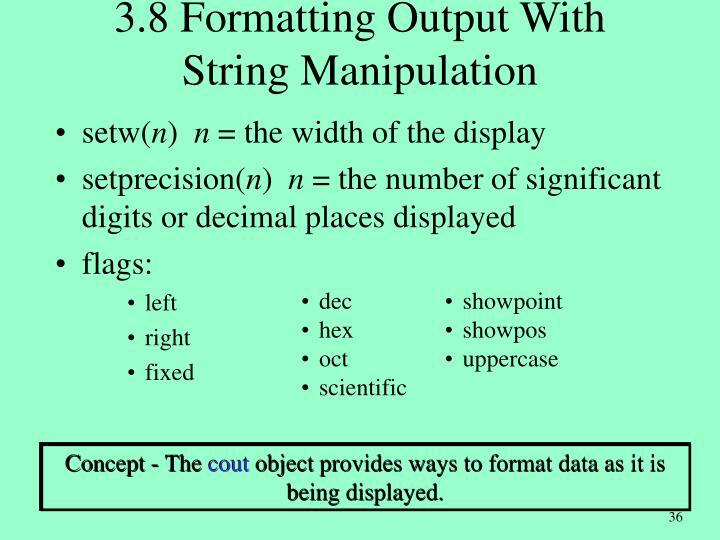 Concept - The cout object provides ways to format data as it is being displayed. 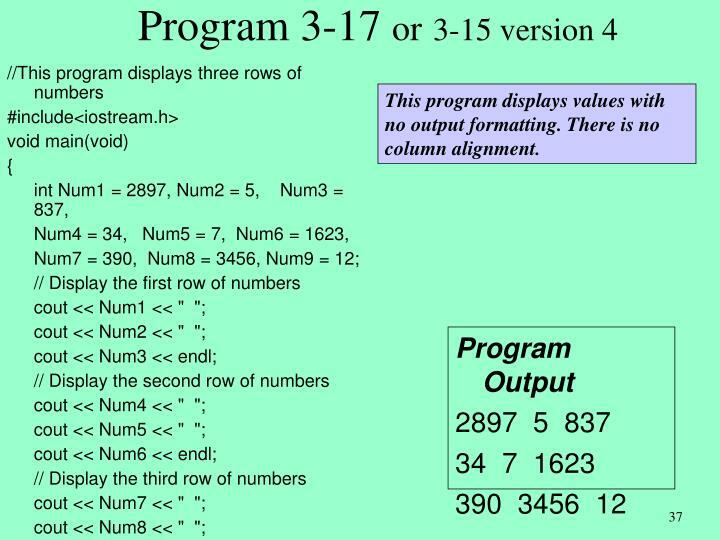 This program displays values with no output formatting. 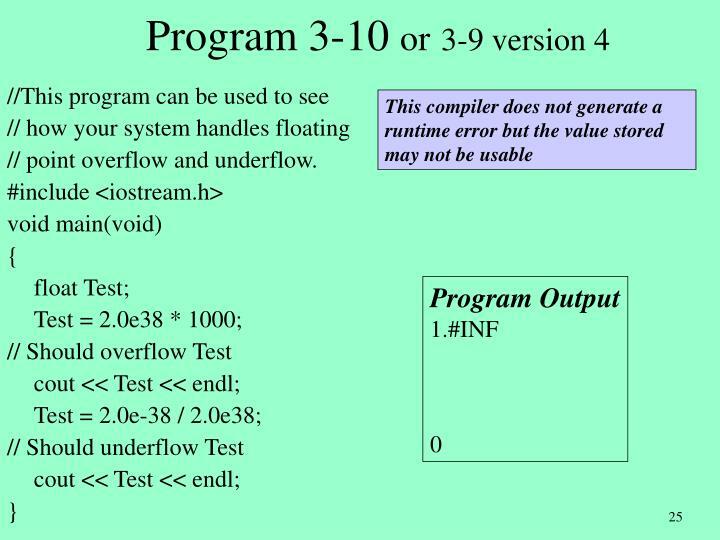 There is no column alignment. 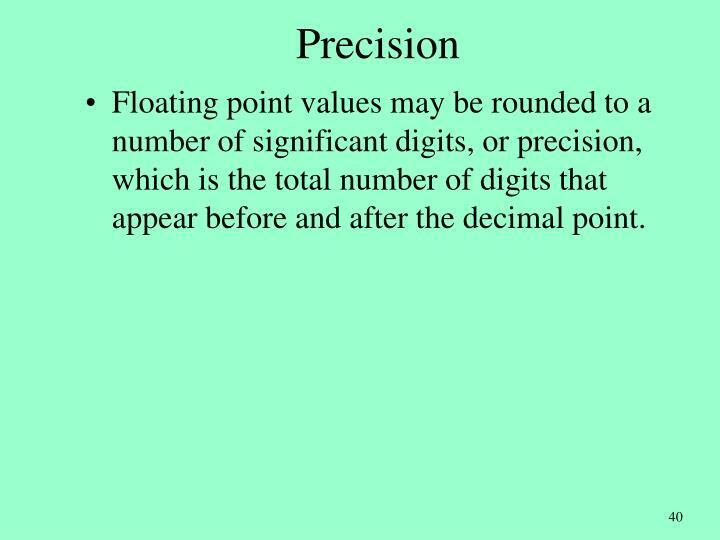 Floating point values may be rounded to a number of significant digits, or precision, which is the total number of digits that appear before and after the decimal point. 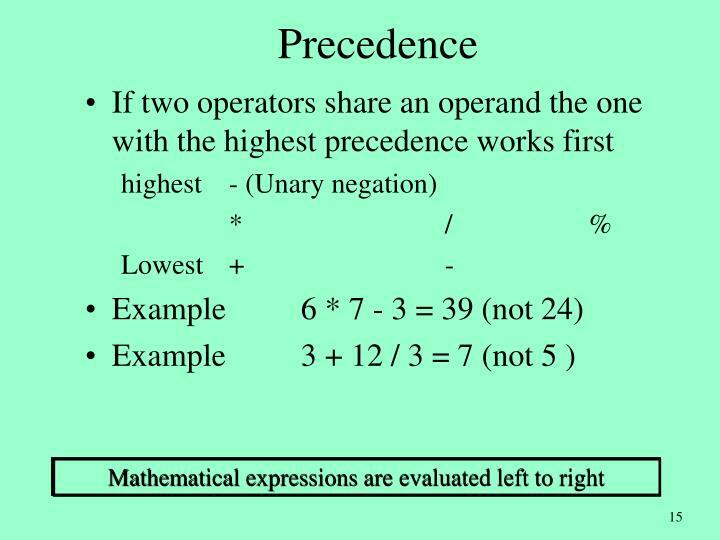 The decimal point is displayed only if there are digits to the right of it. 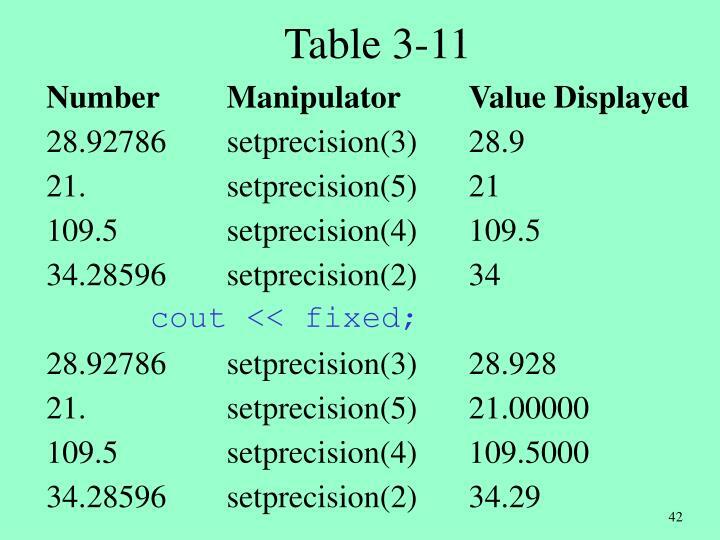 fixed	Displays floating-point numbers in fixed point notation. 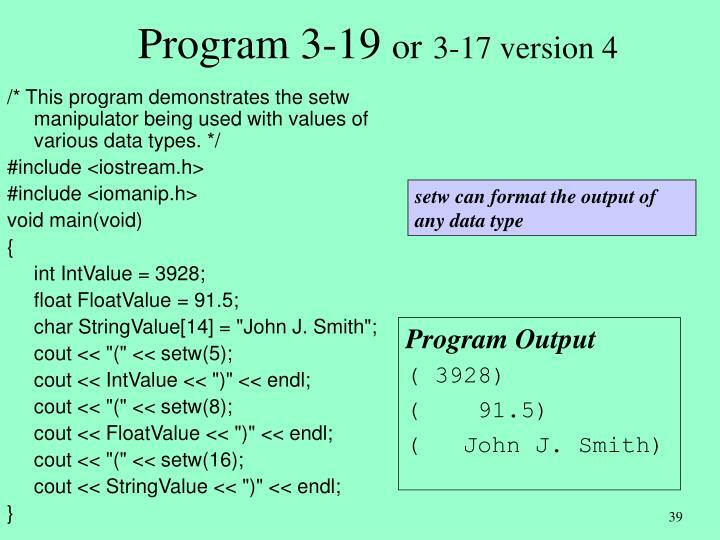 setw(n)	Establishes a print field of n spaces. 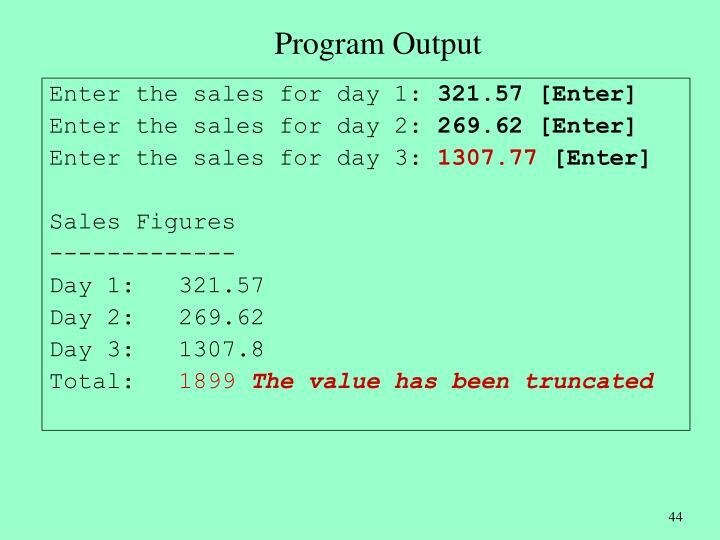 showpoint	Causes a decimal point and trailing zeros to be displayed, even if there is no fractional part. 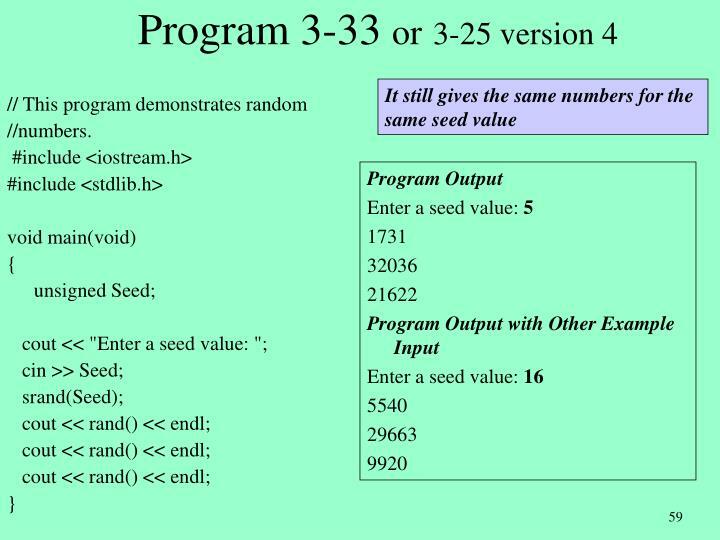 left	Causes subsequent output to be left justified. 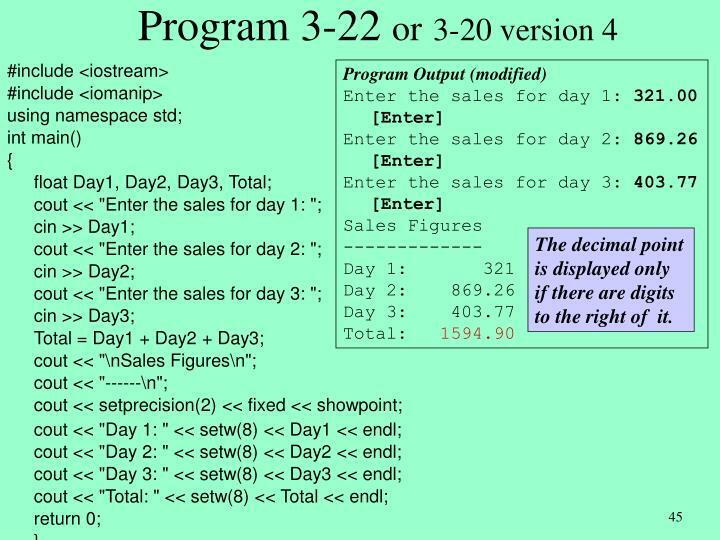 right	Causes subsequent output to be right justified. 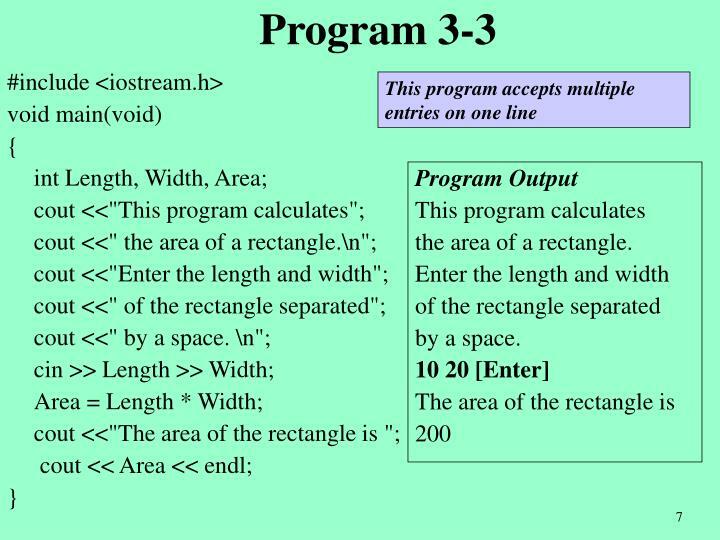 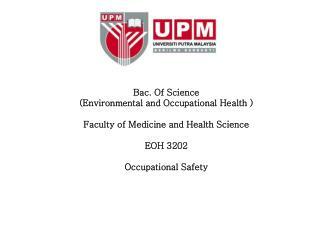 The field width only pertains to the very next item entered by the user. 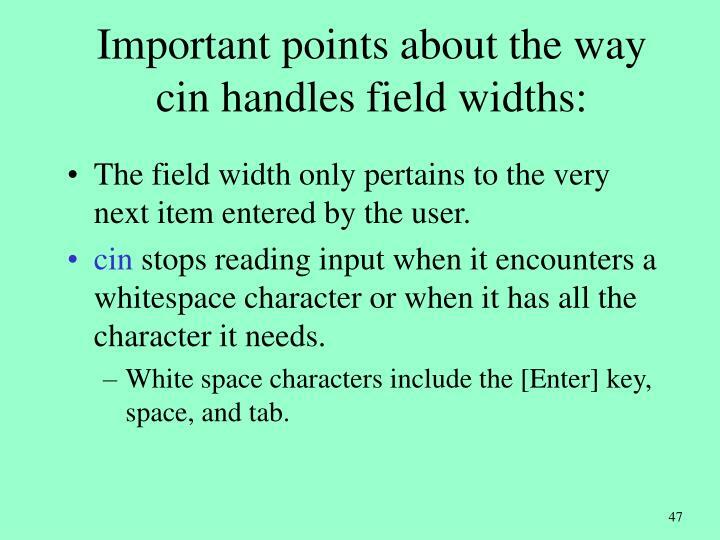 cin stops reading input when it encounters a whitespace character or when it has all the character it needs. 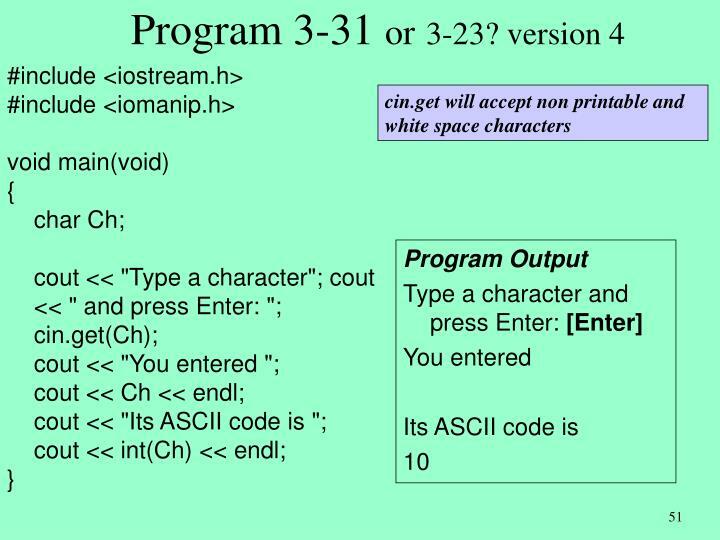 White space characters include the [Enter] key, space, and tab. 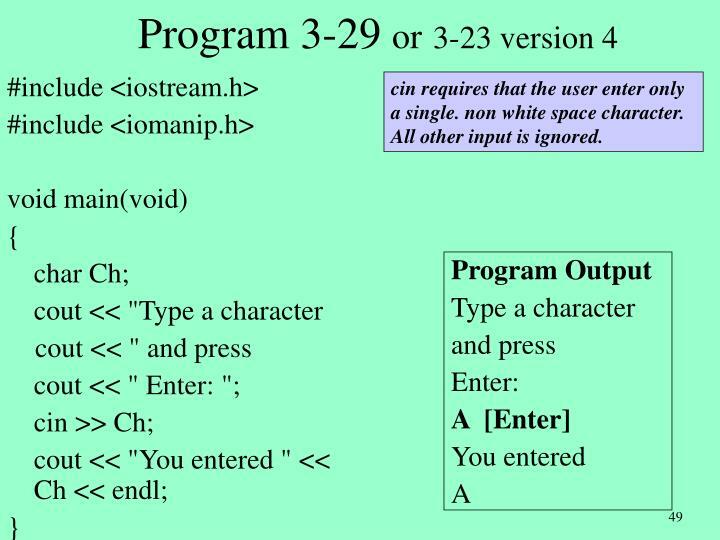 cin requires that the user enter only a single. 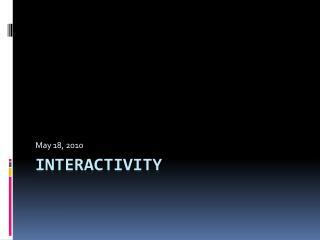 non white space character. 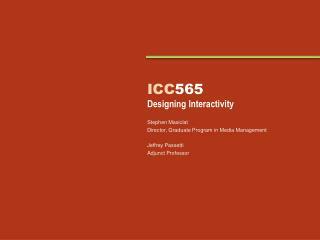 All other input is ignored. 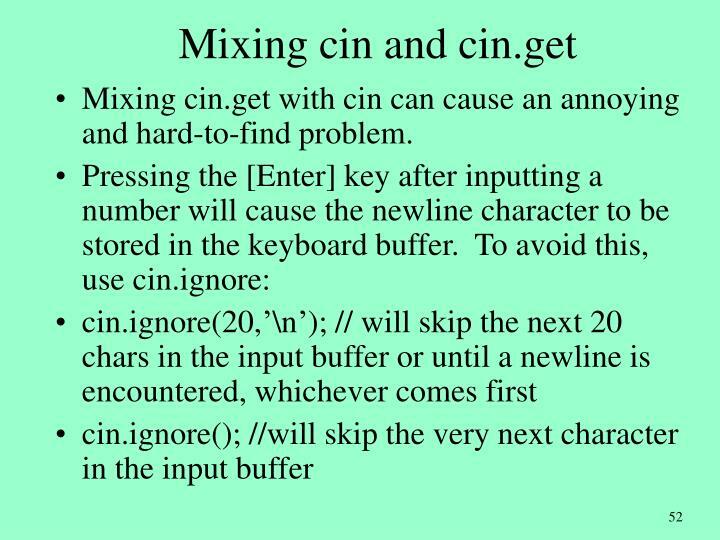 Mixing cin.get with cin can cause an annoying and hard-to-find problem. 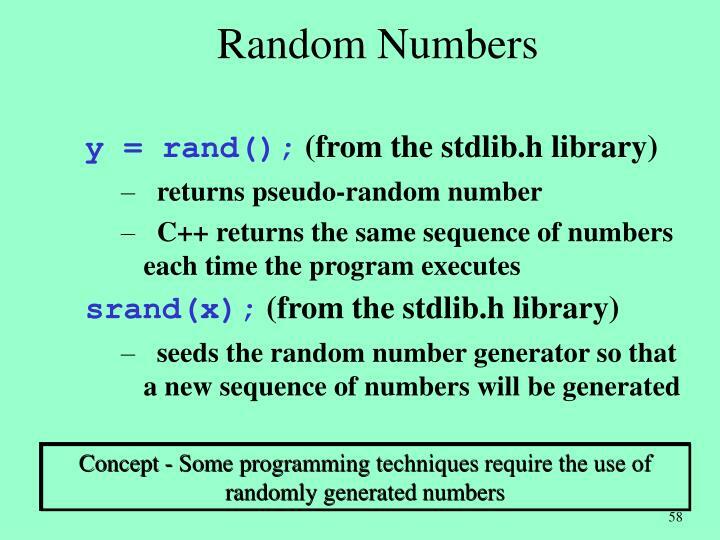 Concept - The C++ runtime library provides several functions for performing complex mathematical operations. 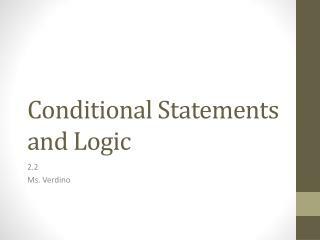 Returns the absolute value of the argument. 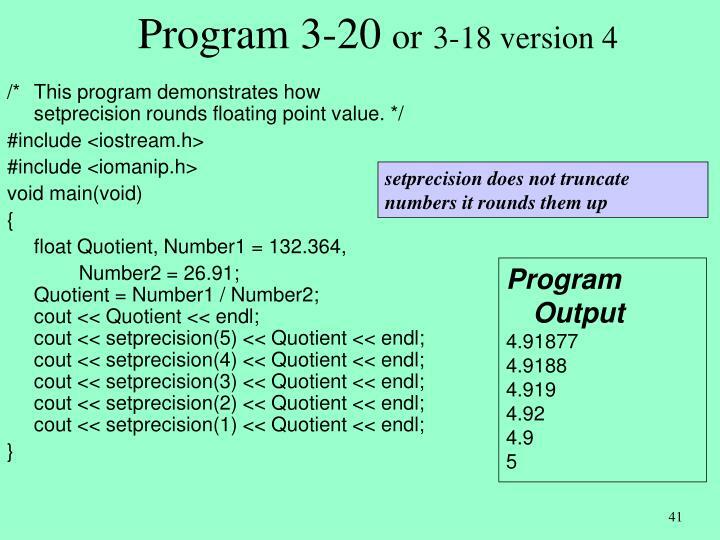 The argument and the return value are integers. 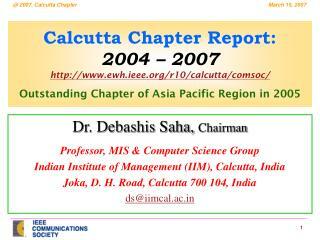 Returns the cosine of the argument. 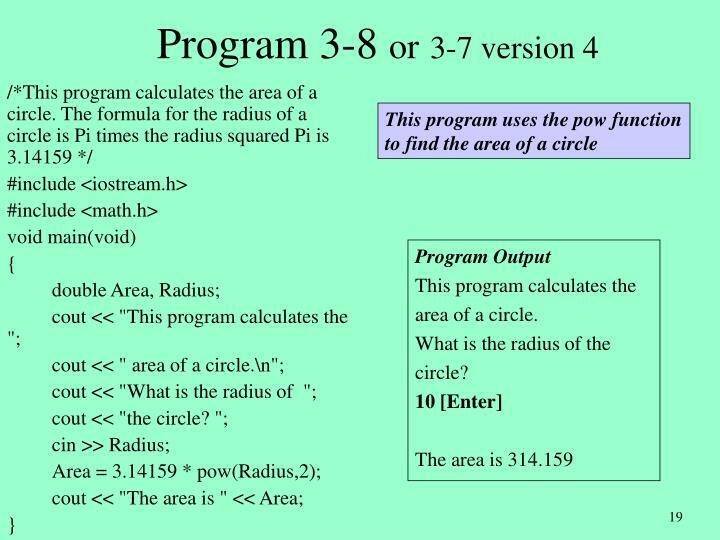 The argument should be an angle expressed in radians. 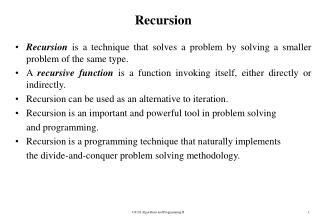 The return type and the argument are doubles. 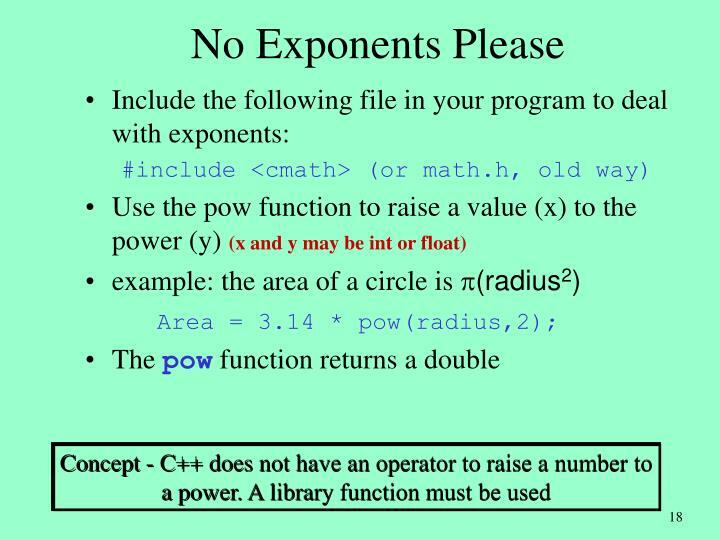 Computes the exponential function of the argument, which is x. 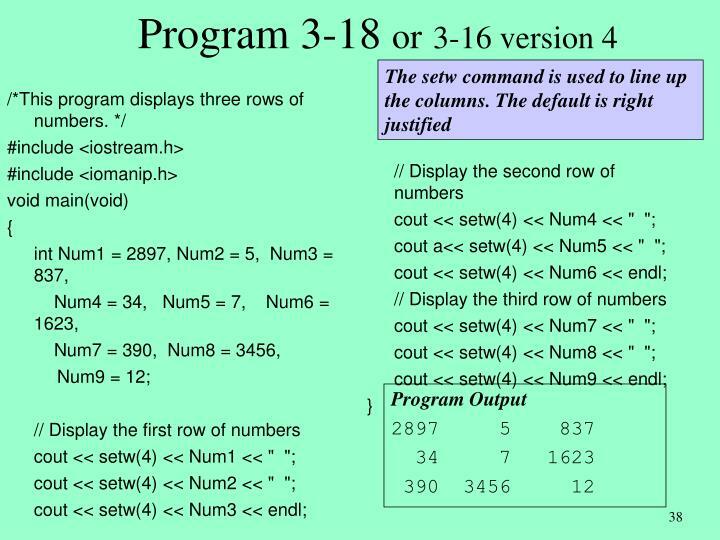 The return type and the argument are doubles. 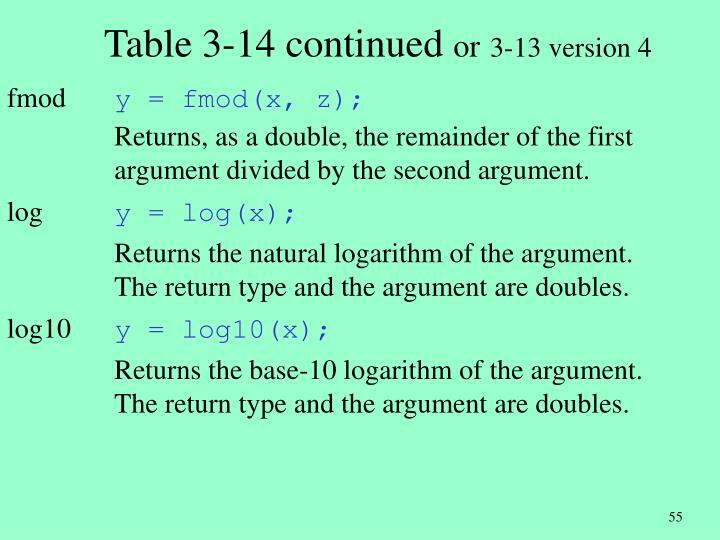 Returns, as a double, the remainder of the first argument divided by the second argument. 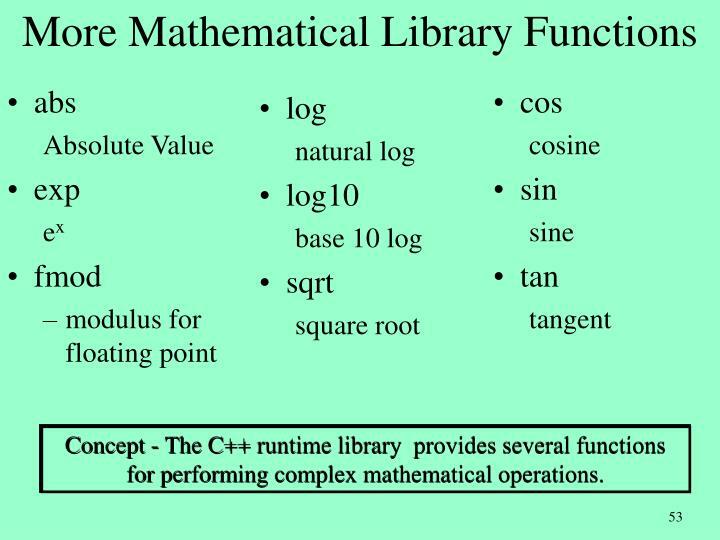 Returns the natural logarithm of the argument. 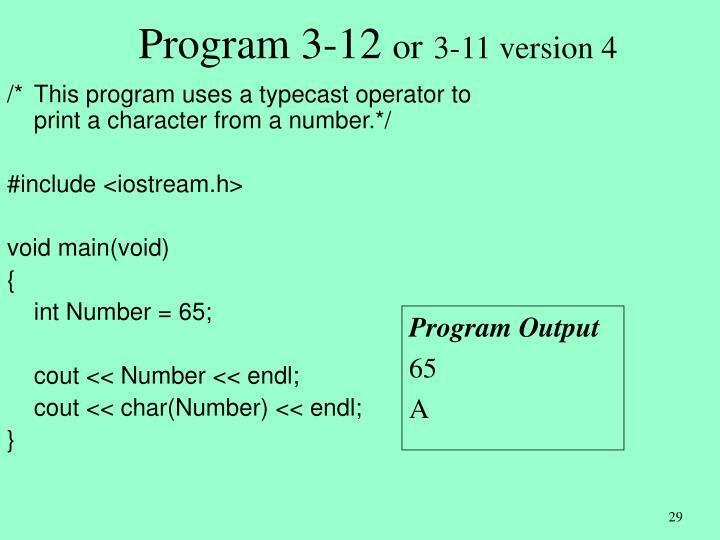 The return type and the argument are doubles. 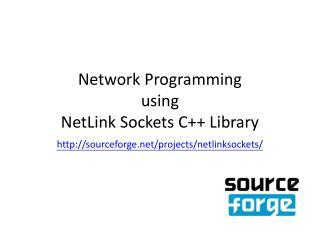 Returns the base-10 logarithm of the argument. 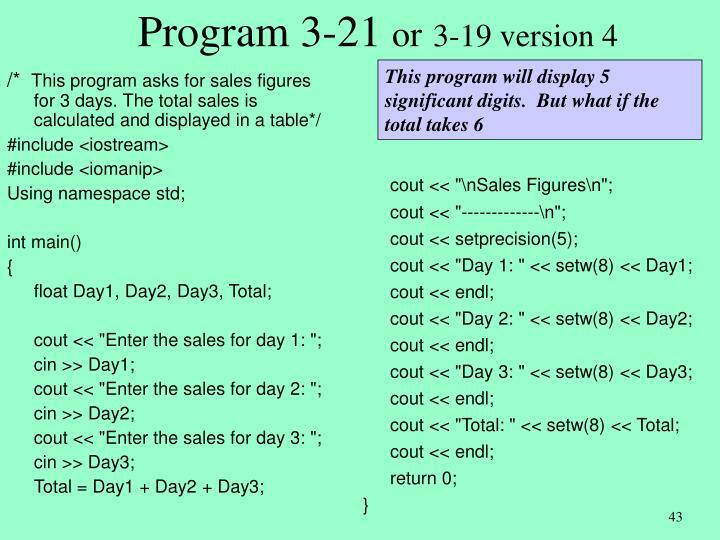 The return type and the argument are doubles. 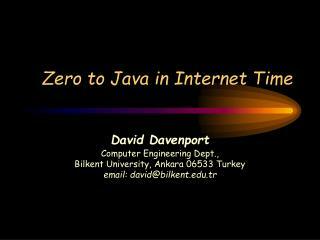 Returns the sine of the argument. 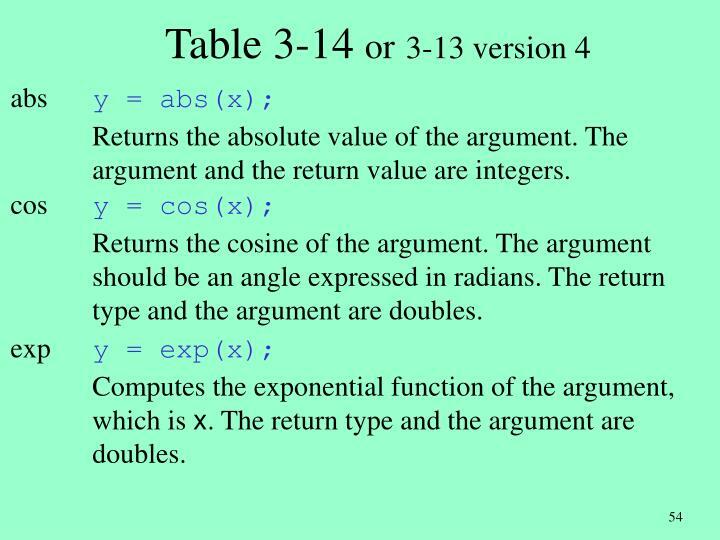 The argument should be an angle expressed in radians. 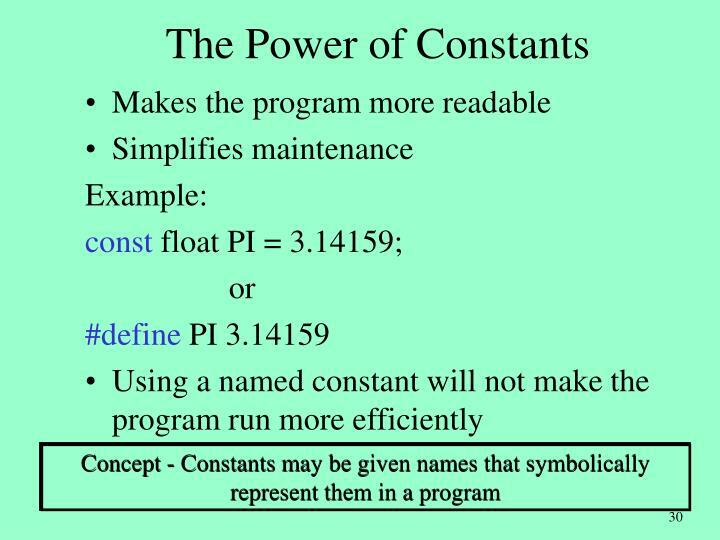 The return type and the argument are doubles. 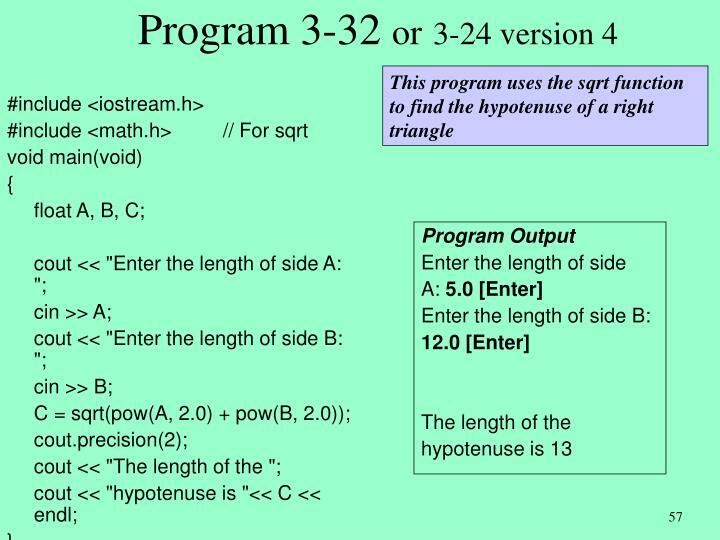 Returns the square root of the argument. 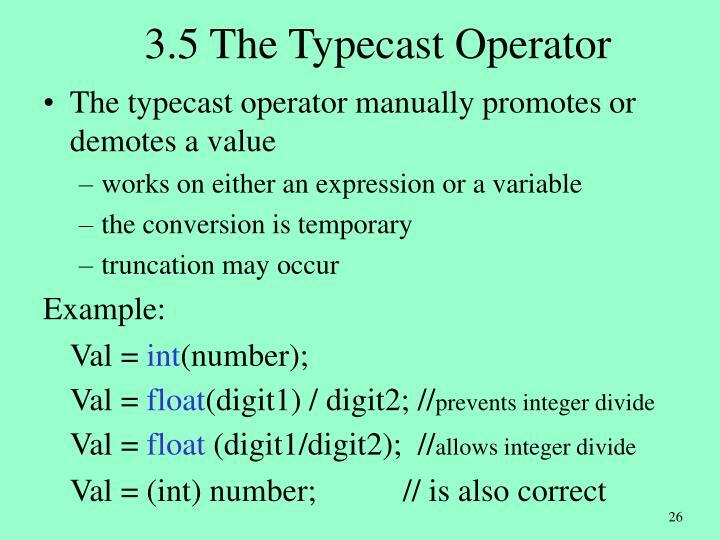 The return type and argument are doubles. 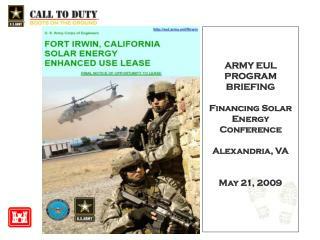 Returns the tangent of the argument. 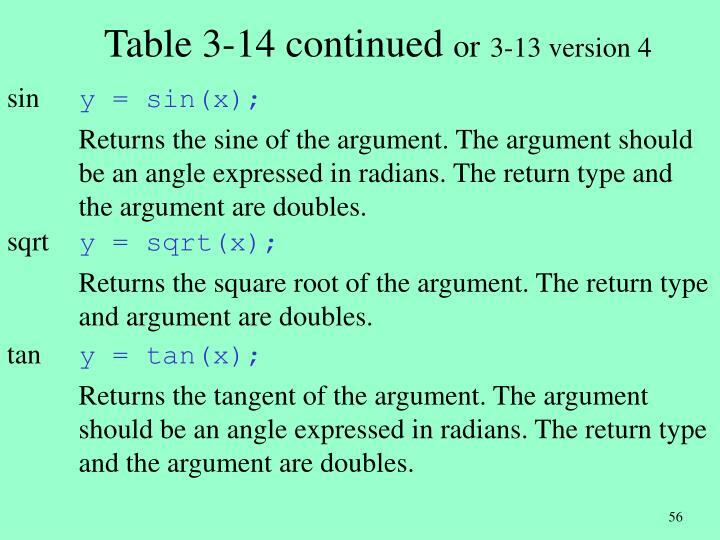 The argument should be an angle expressed in radians. 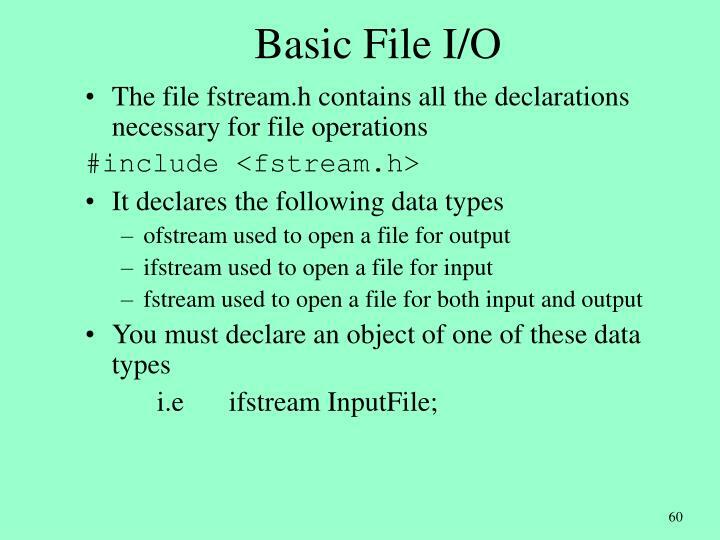 The return type and the argument are doubles. 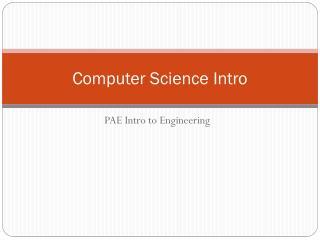 You can create a file using notepad or any other word processor. 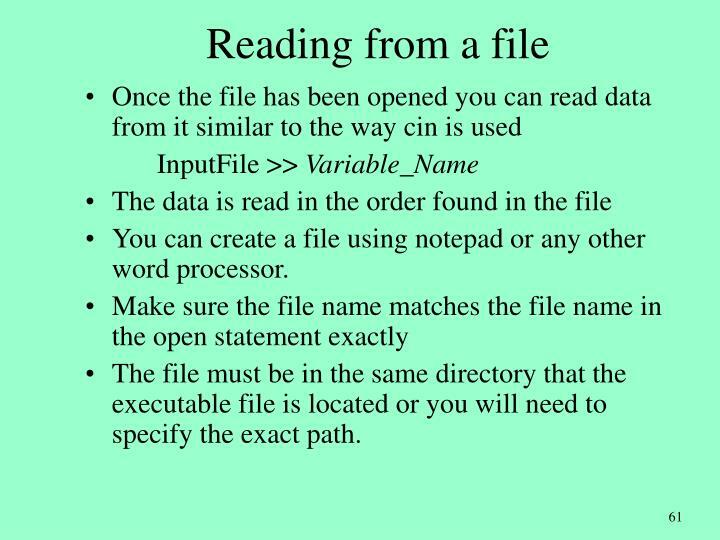 The file must be in the same directory that the executable file is located or you will need to specify the exact path. 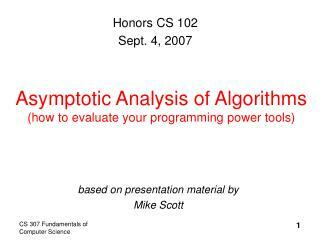 Asymptotic Analysis of Algorithms (how to evaluate your programming power tools) -Honors cs 102 sept. 4, 2007. asymptotic analysis of algorithms (how to evaluate your programming power tools). 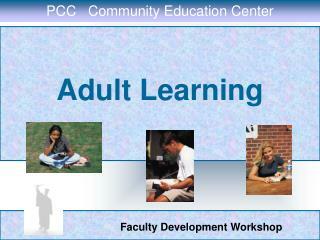 based on presentation material by mike scott.